It's Saturday night and the sounds of Big Bad Voodoo Daddy echo from the Cain Park amphitheater. Crowds clad in fishnets and sky-high heels gather in the lobby of Cedar Lee Theatre for the ritual monthly showing of Rocky Horror Picture Show. Next door at the dimly-lit Parnell’s Pub, a couple deconstructs the arthouse film they just watched over a few pints. At Heights Music Shop, a songwriter steps up to the open mic for the first time. And just down south on Lee at The Wine Spot, a Cleveland Institute of Art (CIA) student has their first art opening. Nestled in Cleveland Heights near Cedar-Fairmount, Shaker Square, and the bohemian hub of Coventry, the district is known for its charm, whether it's served with the crackle and pop of the skillet at Mama Joyce’s Soul Food Cafe as they cook up a plate of chicken and waffles or reflected in the slightly cynical, but nonetheless familiar, face of graphic novelist Harvey Pekar’s statue at the Cleveland Heights-University Heights Library. Here, you can have hearty seasonal tacos at Lopez on Lee, watch with bated breath as the Cavs dunk hoop after hoop at Brennan’s Colony and finally get that ink you always wanted at Lucky Sparrow Tattoo. It’s not just these independent businesses putting their faith in Cedar-Lee. This May marked the beginning of the six-month Lee Road Street Improvements initiative, a $3.5 million beautification project that includes street resurfacing, new sidewalks and new traffic lights to make the neighborhood safer and more accessible for all. 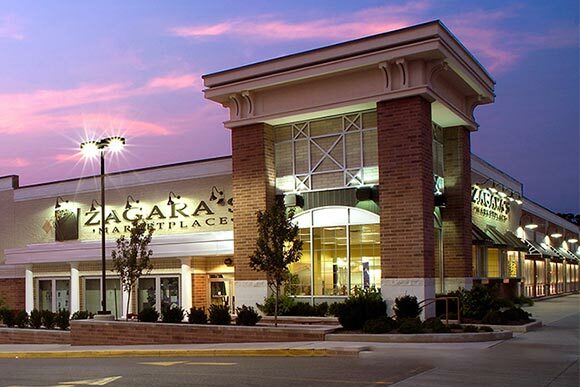 Zagara's MarketplaceThe synergy is palpable, and the growth couldn’t happen anywhere else, says Cedar Lee Special Improvements District board president and owner of grocery store Zagara’s Marketplace, John Zagara. The offerings range from classy to quirky to artsy to laidback, and it all thrives on local support. Communitywide events, such as the annual Heights Music Hop organized by local organization FutureHeights, help to tie it all together. When Eric Rogers closed up his South Euclid restaurant Nevaeh, he was going to focus solely on catering. That is until he laid eyes on the corner storefront that would become Black Box Fix in 2015. In just one year, the sandwich shop has grown leaps and bounds. So much so that Rogers has decided to move into a larger space on the street and transform the business into The Fix, which he hopes to open by mid-July or early August. He won’t drop the sandwiches that have garnered his loyal following, but he will revive some of the entrees that worked best at Nevaeh and create a menu with plenty of Creole influence. There’s no shortage of other places to grab a bite in Cedar-Lee. The popular Anatolia Café serves Turkish and Mediterranean fare, Taste is a sleek, contemporary wine bar and Marotta’s is for anyone with a taste for Italian. When it’s late into the evening and you’re craving barbeque ribs and creamy mac and cheese, the Rib Cage Smokehouse satisfies. 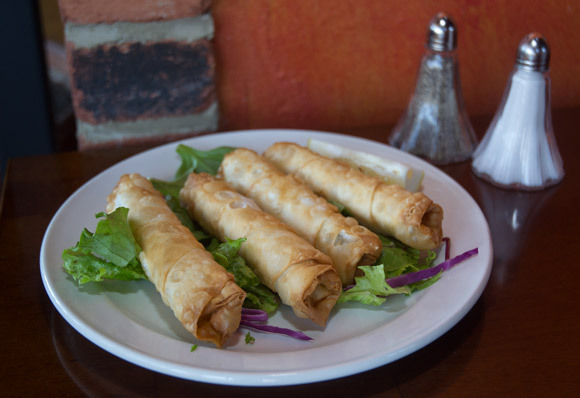 The interior alone is worth a visit to the intimate, Moroccan-inspired MoMo’s Kebab. Or gather a group to dive in and get your hands messy at the new Boiling Seafood Crawfish – don’t worry, there are plenty of paper towels on the table to go around. For a more casual affair, follow the smell of fresh bread to Stone Oven or stop into the newly renovated Phoenix Coffee for a mid-day meeting. Knock a couple brews back with delightfully good food at the Tavern Company; meet up with friends for a game of darts at the Social Room; pick up a pie from Dewey’s Pizza or dial up Richie Chan’s for take-out. Just need to grab a treat for your sweetie? Drop into Mitchell’s Fine Chocolates. And keep an eye on the Katz Club. Even after a fire shut down its day-to-day operations, the old-fashioned diner car still hosts pop-ups by some of Cleveland’s most exciting culinary names. Much like the way the closing of Eric Roger’s Naeveh gave way to the success of Black Box Fix, out of the ashes rose another phoenix. Heights Music Shop wanted to fill the void of Heights Guitars, where co-owner Darrell Branch was once a manager. Today, the shop sells guitars, repairs instruments, and offers guitar, piano and mandolin lessons. They’ve also started hosting open mics and in-store concerts. Along with Kultivation Theatre, it helps bridge the gap of regular live music in Cedar-Lee. 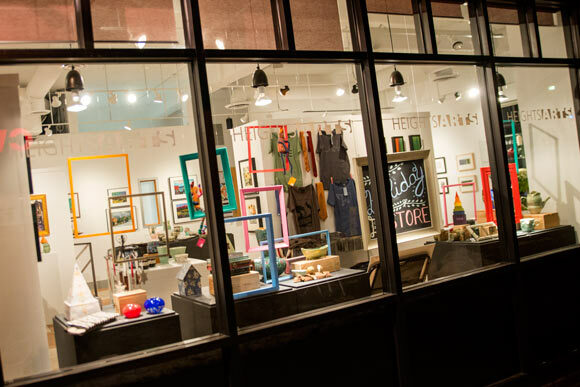 New retail such as Cleveland Running Company is helping to build a daytime presence on the street alongside established neighborhood businesses such as Revive boutique and Cain Park Bicycle. Vintage boutique KazStylious and the eclectic S'Wonderful Gifts add their own flair. Between the Cedar-Lee nightlife and retail, services also keep the neighborhood abuzz. 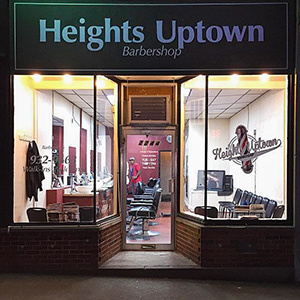 Dominic’s, Finishing Touch, and Heights Uptown are independently operated barbershops. The Atma Center offers yoga classes of all levels. And besides having the best auto repair shop name of all time, The Lusty Wrench tunes up rides with an eco-friendly focus. One a lesser-known Cedar-Lee fact: In an inconspicuous building on Lee Rd., Funny Times cartoon and humor newspaper sketches up comedy publications. The bartenders are busy during an art opening at The Wine Spot, a hybrid bar/beverage store. They pull back the tap on craft brews, uncap bottles of locally made Old City Soda, pop wine corks and mix up cocktails. 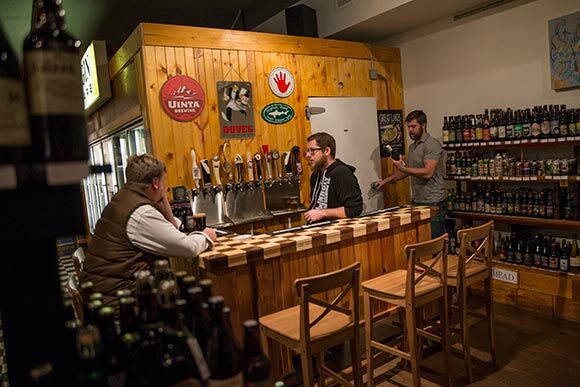 Locals duck in and out to peruse the fridge and grab a carton of suds to-go. A harpist sets up to play near the windows that look out onto the street. This is a typical, lively bar gathering, but the Wine Spot isn’t a typical lively bar. On an average day, you’re just as likely to partake in a municipal forum as listen to the harpist. The diversity of new businesses is the reason Fleischer says he’s more optimistic now than he’s been since the Wine Spot opened more than four years ago. CLE Urban Winery, for instance, is slated to open next month. The two businesses complement each other, recognizes winery owner Destiny Burns. “They say a rising tide lifts all boats,” she notes. Burns says Cleveland is passionate about its craft brewing, so a winery seemed to be the next logical step, particularly for Cedar-Lee. The BottleHouse Brewery’s mead and beer have been so popular that the business has expanded across the city to a Lakewood outpost, while Boss Dog Brewing will join the district when it takes over the former Lemon Grass space later this year. CLE Urban Winery plans to bring in pressed juice from around the country and craft its wine behind a big wall of windows for everyone to see. Burns has also partnered with Graffiti HeArt, a Cleveland non-profit that funds CIA scholarships. Oh, and did we mention they’ll be selling red wine slushies? If Cedar-Lee calls itself “One Amazing Mile,” the arts are its definitive markers. “One thing that’s really unique about Cedar-Lee is that at one end you have Cain Park, where huge acts come through, and then in the middle you have the theater, and on the other end you have Dobama Theatre bookending the district,” says Dobama Theatre artistic director Nathan Motta. Dobama, a full-time equity theater that performs contemporary Broadway and off-Broadway plays, is one of the oldest established off-Broadway theaters in the country. This year, they enter their 57th season. They may have a storied history, but in a way, they’re also a bit of a new theater. Dobama moved to its 165-seat house in Cedar-Lee in 2009, and Motta says they continue to grow substantially. Next year, they’ll be adding a 16-foot bar offering beer, wine and champagne cocktails. In addition to their six productions a year, the theatre also does educational outreach during summer. Partnering with local organizations such as Lake Erie Ink, they bring youth writing to life with their Kids Playwriting Festival. “The educational piece is really important to us because we’re not only giving back to the community, but cultivating a future audience and artists,” says Motta. The theater has always been on the cutting edge. 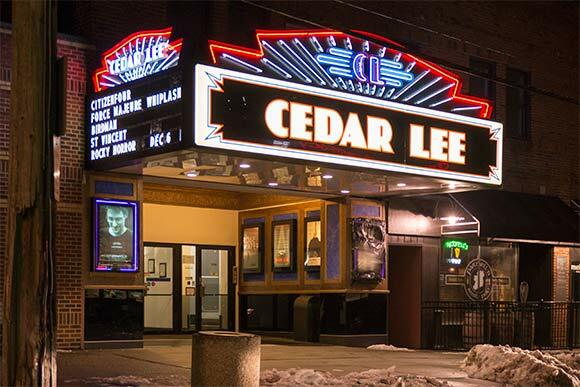 It’s hard to imagine, but at one time, arthouse darling Cedar Lee Theatre was only one screen. Over 90 years in operation, the venerable entertainment mecca now hosts films on six screens and attracts more than 200,000 guests every year. Previously home to the Cleveland International Film Festival for 15 years, they’ve also hosted the Israeli Jewish Film Festival and Italian Film Festival. Like stumbling upon your new favorite artist at a Wine Spot opening or the rush of sharing popcorn during a first date at Cedar Lee Theatre, the stories of our neighborhoods are as unique as the people that roam them. Now come on out to Cedar-Lee and find your own little secret - it's just waiting to be discovered. Further reading: a perfect slice of Little Italy, Detroit Shoreway and AsiaTown. Business: Heights Arts, 2175 Lee Rd. Business: Revive, 2248 Lee Rd. Business: Cleveland Running Company, 2246 Lee Rd.